When borrowing money, the required monthly payments are typically a primary concern. Is the loan affordable, given your income and other monthly expenses? If you’re not sure how much you’ll need to pay, a loan payment calculator—or a bit of math—can help you get the answers you need. Calculators are great for getting a quick answer. They also make it easy to do what-if calculations, which help you truly understand your loan and how your decisions affect your finances. For example, you can compare what happens if you borrow slightly less, or what happens when you get a lower interest rate. Before you start calculating payments, you need to know what type of loan you’re using. You use a different calculation (or calculator) for different loans. For example, with interest-only loans, you don’t pay down any debt in the early years—you only “service” the loan by paying interest. Other loans are amortizing loans, where you pay down the loan balance over a set period (such as a five-year auto loan). Use a basic loan calculator: For most home and auto loans this Google Sheets calculator will handle the math for you, so you don’t have to do calculations manually. Build a spreadsheet: You can also build more advanced spreadsheets in programs like Google Sheets and Microsoft Excel to do the calculations and show you how the loan works year-by-year. See more details about using a spreadsheet for standard amortizing loans (including auto loans, home loans, and personal loans). If that doesn’t work, don’t worry—we’ll cover several other payment calculations here as well. This formula works for most amortizing loans, which covers most loans—except credit cards and interest-only loans. Assume you borrow $100,000 at 6 percent for 30 years, to be repaid monthly. What is the monthly payment? The monthly payment is $599.55. 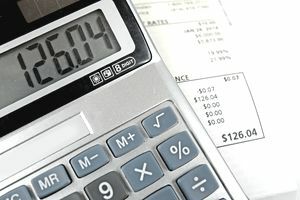 Check your math with an online payment calculator. The loan payment calculation for an interest-only loan is easier. Multiply the amount you borrow by the annual interest rate. Then divide by the number of payments per year. There are other ways to arrive at that same result. Example (using the same loan as above): $100,000 times .06 = $6,000 per year of interest. 6,000 divided by 12 equals $500 monthly payments. Check your math with the Interest Only Calculator on Google Sheets. Assuming you never make additional payments to reduce the principal balance, your monthly payment will remain the same. However, you will have to pay off that loan someday. For example, you may have to start making amortizing payments after the first ten years, or you may need to make a balloon payment at some point to get rid of the debt. Credit cards are also fairly simple. Lenders typically use a formula to determine your minimum monthly payment. For example, your card issuer might require that you pay at least 3 percent of your outstanding balance each month, with a minimum of $25 (whichever is more). Of course, it’s wise to pay more than the minimum, but that’s the amount you have to pay to stay out of trouble. Check your math with the Credit Card Payment Calculator on Google Sheets. But what happens the following month? Your credit card charges interest each month, and you might spend more on your card after you make a payment. In many cases, the same minimum applies: A percentage of your total loan balance is due. For more details, see a tutorial on calculating your card payments and how each payment affects your balance. Big picture: Those three components combined make up the total cost of whatever you're buying. But it’s hard to understand exactly how much you pay when you have several offers from different sources—that’s where the calculations above come in handy. For example, the amortization calculator mentioned above adds up the lifetime interest cost of your loan, and shows you how much you spend on interest every month. APR: Annual percentage rate (APR) is another useful tool for comparing loan costs. On mortgages, APR accounts for up-front costs (closing costs) in addition to the interest rate you pay on your loan balance. As a result, you get closer to an apples-to-apples comparison among lenders. But the lowest APR isn’t always the best loan, and the calculations above can tell you why. As a rule of thumb, high up-front transaction fees do less damage for loans you keep for a long time. Your monthly payment is just a result of the loan amount, interest rate, and length of your loan. Salespeople (including lenders) can shift things around to make it seem like you’re getting a good deal—even when you’re not. For example, some auto dealers want you to focus solely on the monthly payment: How much can you comfortably afford each month? With that information, they can sell you almost anything and fit it into your monthly budget. But you aren’t necessarily getting a good deal, and the cost of your loan will dramatically increase the total amount you end up paying for your car. How do they do it? One of the easiest ways is to stretch out the loan over a few more years: Instead of a four or five-year loan, they’ll propose a seven-year loan with lower monthly payments. Unfortunately, stretching out the loan means you’ll pay more in interest over the life of the loan—effectively paying more for whatever you bought. You’ll almost certainly do better if you negotiate on the purchase price, instead of settling on a monthly payment. You can borrow anywhere you want: from any bank, credit union, or online lender. You don’t need to rely on an auto dealer for financing. You won’t always get a lower monthly payment this way (so it might not feel like you’re doing better), but you’ll probably spend less overall. To further minimize your costs, pay off your debt early. As long as there's no prepayment penalty, you can save on interest by paying extra each month or by making a large lump-sum payment. Depending on your loan, your required monthly payments going forward might or might not change—ask your lender before you pay. Any time you calculate your loan payment and costs, you should consider the results a rough estimate. The final details might be different depending on the assumptions your lender uses, but you’ll still get valuable information.